The fight against All Aboard Florida played out in the nation’s capital Friday, in a federal hearing to decide whether the passenger rail project will get $1.75 billion in tax exempt bonds. 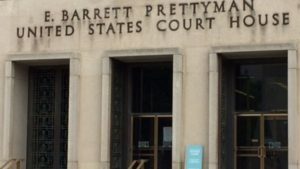 The sixth floor of the E. Barrett Prettyman federal courthouse on Constitution Avenue is far from the heart of the rail battle — the Florida East Coast Railway corridor — but at least two local activists and Indian River County Commissioner Tim Zorc attended the hearing. The more than three-hour event outlasted early predictions of time by more than double with U.S. District Court Judge Christopher Cooper picking at each side’s arguments and questioning whether Indian River and Martin counties were hitting the “goal posts” in their attempt to block the financing. The $2.9-billion project is hoping to use tax exempt bonds to help complete the project, but Martin and Indian River counties filed federal lawsuits against the U.S. Department of Transportation saying, in part, the bonds cannot be used for projects such as All Aboard Florida. All Aboard Florida is an intervenor in the suit.